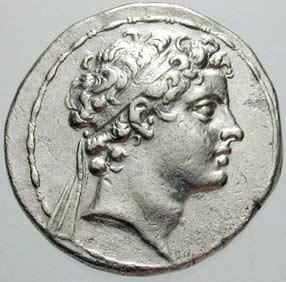 Antiochus V was ruler of the Greek Seleucid Empire from 163–161 BC. He was only 9 years old when appointed king by the Romans, and the real power resided with his regent, Lysias. The true heir to the throne, Demetrius, was kept as a hostage in Rome following the peace treaty of Apamea. Lysias and Demetrius did not scrap all the warships and war elephants promised in the peace treaty from 188 BC. When the Romans heard this, they sent a fleet to sink the Syrian warships. Lysias dared not intervene, but this so enraged the Syrians that they assassinated the Roman ambassador and consul G. Octavius. At this juncture Demetrius escaped from Rome and was received in Syria as the true king. Antiochus and Lysias were soon executed.